We in media – Центр "Нова Європа"
All Alyona Getmanchuk Daria Gaidai Kateryna Zarembo Leonid Litra Маркіян Кузьмович Olga Lymar Sergiy Solodkyy Сніжана Дяченко Тетяна Левонюк Центр "Нова Європа"
What can we expect from Ukraine’s elections? Ukraine’s election has pitted a comedian against a candy baron and a populist ex-PM. Who will have the last laugh? 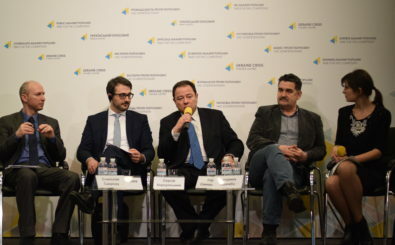 General Prosecutor vs. Anti Corruption Action Centre: What is the Connection between the Investigation in Ukraine and the US elections 2016?